My boss readily admits that she doesn't know a whole lot about jazz. But she lets me write all this nonsense on the Internet, so I'm not complaining. And at least she's willing to learn. So every week -- or at least as often as possible -- she and I get together to listen to and Instant Message about a different great jazz song. "Cubano Be" and "Cubano Bop" are undoubtedly landmarks of Latin jazz history. The symphonic collaboration between Chano Pozo and Dizzy Gillespie helped to validate Afro-Cuban rhythms in the arena of serious music. And it's especially appropriate to have a listen to it today, because lurking behind the scenes was the late George Russell. 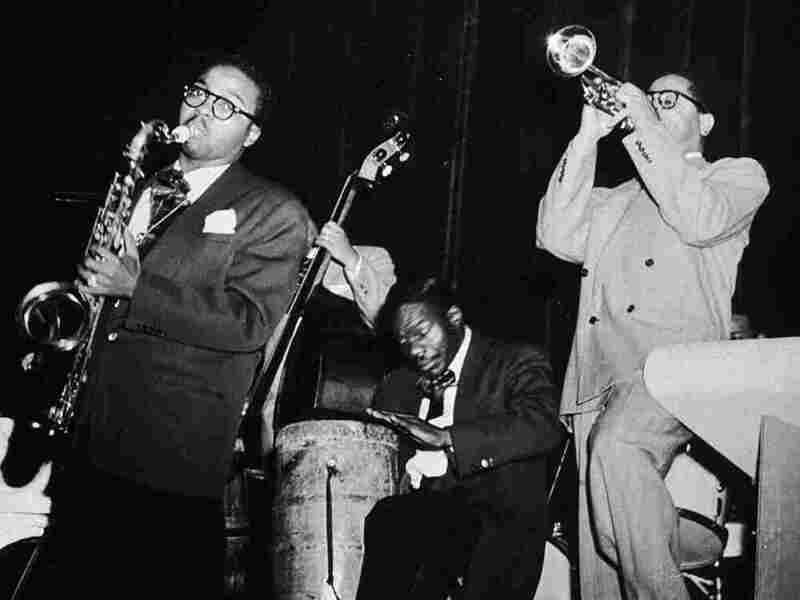 "Cubano Be / Cubano Bop," recorded by the Dizzy Gillespie Big Band. Dizzy Gillespie, trumpet; with Dave Burns, Elmon Wright, Lamar Wright Jr., Benny Bailey, trumpets; William Shepherd, Ted Kelly, trombones; John Brown, Howard Johnson, alto saxophones; Joe Gayles, Big Nick Nicholas, tenor saxophones, Cecil Payne, baritone saxophone; John Lewis, piano; Al McKibbon, bass; Kenny Clarke, drums; Luciano "Chano" Pozo, congas/bongos. Arr. George Russell. New York, N.Y.: Dec. 22, 1947. Boss Lady: I'm picturing rapscallions in a getaway scene, pushing through the busy, dirty, exotic streets of Cuba. It's a movie from the 1950s. Boss Lady: Yes, you are correct! Boss Lady: The drumming? The rhythm? Boss Lady: That's right around the time of West Side Story, so I guess it was in the air. Boss Lady: Do you roll the 'R' in conguero? Boss Lady: Is Chano Pozo the one singing? Boss Lady: OK, so instead of approximating Afro-Latin culture, Dizzy Gillespie went right to the source? I have no idea what he's chanting. Neither did the band of Americans either, apparently -- but they shouted it back! Boss Lady: Ha! Hopefully, they didn't regret it later. Boss Lady: I like the raucous feel of this, but it does feel kind of dated, too. I wonder why? And that was like 61+ years ago, so of course it's somewhat dated. Boss Lady: I guess I'm asking why it sounds so much like it was from that period, or like it's from an old movie. me: Good question. Recording quality is one thing, of course ... but it does have that cinematic bombast to it, right? Boss Lady: What makes you say that? Listen closely: it's not just a fun melody based on a song form, right? me: Yup. It is, as a music professor might say, through-composed. The form doesn't repeat -- it's scripted all the way through. There's that melodic theme, but that only surfaces occasionally. There isn't even a whole lot of improvising (other than from Chano Pozo) -- just that little tag from Gillespie at the end of "Cubano Be"
Boss Lady: Maybe that's one of the reasons it sounds like a soundtrack, because it keeps moving forward into different "scenes" rather than circling back all of the time? Boss Lady: How would I know that, Patrick? Boss Lady: Wow, I can't believe you saved that 'til the end!